Fusilli lunghi, clams, and shishito peppers at Pammy’s in Cambridge. If ever there were a year that proved food is newsworthy, 2017 was it. Prominent chefs and restaurateurs such as Mario Batali and John Besh faced accusations of sexual harassment, beginning a conversation about the dark side of the hospitality industry (more stories are sure to come). On the flipside, reminding us of its generosity and humanity was Jose Andres. The chef spearheaded an effort with his nonprofit group, World Central Kitchen, to feed Puerto Rico after Hurricane Maria, providing meals to nearly 2 million people. Then he moved on to California communities affected by wildfires. When Donald Trump took on immigrants, restaurants took on Donald Trump, defending the community that makes the industry run. Amazon bought Whole Foods, Tom Brady entered the meal-kit market, Tina Fey told us to binge on sheet cake instead of engaging in protest (why not bring sheet cake to the protest, I ask you). We freaked out over phthalates in boxed mac and cheese and wood pulp in Parmesan — and then the FDA chided West Concord’s Nashoba Brook Bakery for including “love” in the ingredients list for its granola. Priorities, people? When it all got to be too much, our local restaurants were there for us, offering sustenance and a place to gather. Fast-casual continued to be a holy grail, with places like barbecue joint Smoke Shop expanding. The Hawaiian dish poke was suddenly everywhere. Local remained sustainable, as new restaurants such as Cultivar and Field & Vine demonstrated. There were splashy openings like Les Sablons in Harvard Square, but for the most part it was a year when smaller, neighborhood-oriented restaurants quietly ruled. And, of course, there were restaurants we were sorry to see close their doors, from Belly Wine Bar and the Blue Room to Blue Ginger and (after a brief return) East Coast Grill. As always, there were standouts. Here are the local restaurants and chefs particularly deserving of recognition in 2017. Just as soon as it opened, everyone was talking about this little spot between Central and Harvard squares. In part, it’s the menu that makes it special, a pastiche of appetizers, pasta dishes, and main courses that are as smartly put together as they are delicious: foie gras torchon with figs and house-made focaccia, lumache with gochujang-warmed Bolognese sauce, a Berkshire pork chop with cream of fresh wheat, pancetta dashi, and radishes. Chef Christopher Willis has cooked at Rialto, Clio, and New York spots such as ABC Cocina and Sfoglia; at this restaurant (named for wife and co-owner Pam Willis) he takes loose inspiration from Italy. Desserts — cocoa nib cake with caramel budino, crostata with crème fraiche ice cream — are a sweet spot, and the drinks menu charms, with kicky cocktails and a long list of digestivi. But it’s not so much the part as the parcel: The staff is warm and knowledgeable, the space is lovely (that fireplace! ), and the details are seen to with care. Eating here just kind of makes you feel good. In January, Tracy Chang opened Pagu in Cambridge, navigating a liquor-license process a Globe investigation this year found “opaque and arbitrary.” Chang, who grew up in a restaurant family (her grandmother ran longtime Japanese spot Tokyo), is not the sort to let that kind of thing put a hitch in her giddy-up. A year later, her restaurant is open for breakfast, lunch, and dinner. It’s also a community gathering place, playing host to sake dinners, musical events, luaus, and heady conversations (say, a talk on “creating artificial intelligence for flavor discovery”). Chang weaves together her diverse experiences — working at restaurants like the Michelin-starred Martín Berasategui in San Sebastian, Spain; cofounding the popular pop-up Guchi’s Midnight Ramen — into a menu that lands somewhere between izakaya and tapas bar. You’ll find tortilla espanola and jamon iberico, squid ink oyster bao and that Guchi’s ramen. It’s serious fun, fueled by Chang’s passion and commitment. Restaurateur Nancy Batista-Caswell operates two popular Newburyport restaurants, Ceia and Brine, but she had her sights set on Boston. Now she has opened Oak + Rowan (it debuted at the tail end of 2016, missing consideration last year). In restaurant-heavy Fort Point, it aims high. 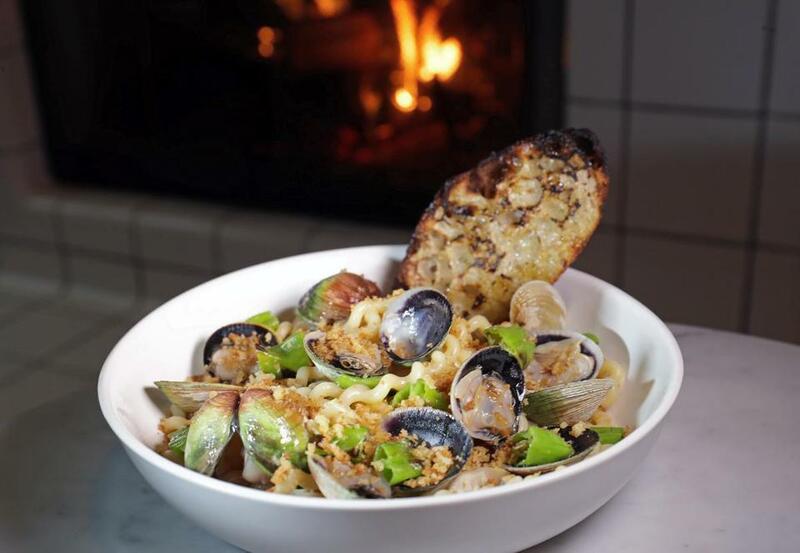 Chef Justin Shoults offers caviar service and carefully composed cheese plates, lobster-uni spaghetti and duck with rye spaetzle, kohlrabi, and pear. Pastry chef Brian Mercury turns out creatively composed frozen desserts and the likes of apple tarte Tatin with chestnut mousse and rose geranium gel. Despite the sophistication of the food, the atmosphere is far more friendly than formal. In these days of fast-casual spinoffs, it’s a pleasure to see someone open a restaurant that swings for the culinary fences. Previously in this space was Hungry Mother, a French-Southern hybrid beloved by many. The same team opened Café du Pays, this time showcasing French-Canadian fare. The region is so close, but (with the exception of poutine) its dishes have been so far away. Now we have a place to eat the meat pie tourtiere, the pork pate cretons, deer frites, and pudding chomeur. The perfectly cooked half-duck with sunchoke puree is one of the best dishes of the year. Steel & Rye captured hearts in Milton when it opened in 2012. Now the people behind it are doing the same in Brookline. Prairie Fire puts food in wood flames, from which it generally emerges tasting very good. There might be Brussels sprouts, roasted oysters, meatballs, and short rib with polenta and mushrooms. There will certainly be pizza, pleasantly blistered and judiciously topped. If you live in Coolidge Corner, it’s the place you want to eat on a Friday night, along with a good number of your neighbors. Now you can get your Maine seafood fix without the drive. The original Eventide, a longtime favorite in Portland, often has lines out the door; last year, chefs Andrew Taylor and Mike Wiley won a well-deserved James Beard award. Now there’s a branch in Boston. It’s more of a quick-service place than its sister, but the food is much the same: sparkling local oysters and twists on New England classics like clam chowder, lobster stew, and lobster rolls. That last dish alone is reason enough to come, generous chunks of meat cloaked in brown butter and piled into a Chinese-inspired steamed bun. It’s excellent, but so are the tuna crudo and — yes — even the landlubber burger. An almost entirely gluten-free izakaya specializing in Japanese whiskey and sake with a name that’s not exactly easy to remember? It just might work! And it does, thanks to chef-owner Chris Chung, who deploys his skills from Uni Sashimi Bar and AKA Bistro, but also draws on the Hawaiian dishes of his youth. Stephen Connolly, who was sake sommelier at Uni, oversees the drink. He’s a font of boozy knowledge, and you can’t help but catch his passion along with a buzz from the hard-to-come-by pours he’s eager to share with you. Sit a while, snack, and get schooled in a most enjoyable fashion. To visit Anoush’ella is to realize how much the South End was craving this kind of food: healthy, flavorful, fairly priced. The menu at Nina Festekjian’s restaurant draws on her Armenian and Lebanese heritage, with grain bowls, salads, and flatbread sandwiches of lentil kofte, za’atar chicken, and more. Everyone is here, from the lululemon crowd to Armenian grandparents. With admirable focus, chef Mike Stark (Coppa, Tiger Mama, Toro) and crew turn out bowls of hand-crafted noodles at Ruckus, where hip-hop plays and art by Takashi Murakami overlooks counter seating and an open kitchen. Ramen is the highlight, but you’ll also find fried pork-belly onigiri and other enticements. From the team behind Shojo, this Chinatown spot manages to be as friendly as it is fast. The folks behind Roxy’s and Area Four remembered something: People like to have fun when they go out. So they teamed up to open this restaurant, bar, and arcade. Eat grilled cheese, tater tot poutine, and bacon cheeseburgers. Drink brightly hued cocktails with funny names (e.g. Worst. Drink. Ever.). Play vintage arcade games and foosball. Laugh. There, that feels good, doesn’t it? It’s been open for a decade, and somehow Myers + Chang manages not just to remain good, but also to up its game and rethink its menu in ways that keep it current without messing up something we already love. With restaurants closing apace, this kind of longevity deserves a salute. Chef-owner Joanne Chang and executive chef Karen Akunowicz still serve dumplings, tiger’s tears, and nasi goreng, but they’ve also added kimchi quinoa bokkeumbap, that ever-present poke, and a host of fun desserts. Oh, and a new cookbook, “Myers + Chang at Home,” for those nights when you just want to stay in. 1145 Washington St., South End, Boston, 617-542-5200, www.myersandchang.com.